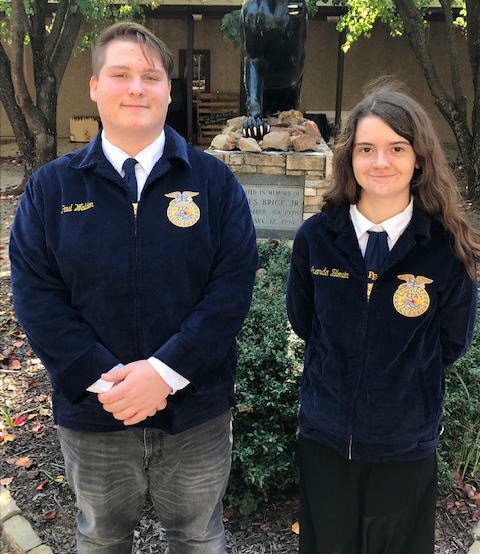 Paris High School FFA (Future Farmers of America) students Paul Walden and Amanda Blouin recently competed in the 2018 Paris District Leadership Development Events contest. The event was held on Tuesday, November 6 at North Hopkins High School. Walden placed 8th in the Job Interview Contest. This contest includes writing a letter of application, completing a job application, a phone interview, a face-to-face interview, and follow-up letter writing components. Creating situations for members to demonstrate their abilities in public speaking, decision making, communication and their knowledge of FFA and agriculture, Leadership Development Events (LDE) reinforce what is taught in the classroom. Contests are held at the district level with those not eliminated advancing to area competitions. Those not eliminated at area competitions will advance to the state competition to take place at Sam Houston State University November 30 and December 1.